This beautiful hardback book contains 576 pages and is amply illustrated throughout. 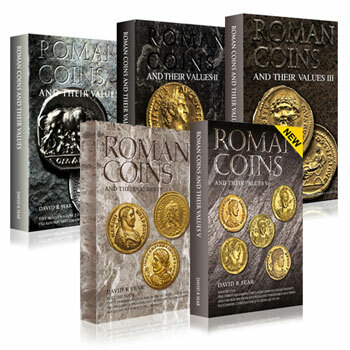 This latest volume in the classic series contains a comprehensive listing of the Roman coinage of the period AD 337-494 with clear black and white photos and up to date values for VF and EF coins. Hardback with dust jacket, 552 pages. By David R Spear, Published by Spink. This third volume continues the comprehensive revision of this era, and covers in detail the next fifty years. Contains clear black and white photographs andvalues for VF and EF coins, in both UK sterling and US dollars. Hardback with dust jacket, 536 pages, black & white illustrations. Roman Coins and Their Values, Volume I: The Republic andthe Twelve Caesars 280 BC - AD 96 by David R Sear. Hardback with dust jacket, 532 pages, black & white illustrations. Buy all 5 volumes of the series and save £50!